My mother gave me several issues of the magazine Saveur that she was finished with. They have been sitting on the coffee table in the living room for several months and recently, I found myself flipping through one, Issue 182 from April 2016. The cover promised a Taste of Sicily, and I went through the article in search of bread recipes and I wasn’t disappointed. Scaccia is favorite snack food in Sicily and can be easily found in shops and is made with many thin layers of semolina bread stacked with tomato sauce and a traditional cheese called Caciocavallo, a traditional stretched cheese curd. Having never traveled to Sicily, I will accept that fact and add this to it, it is not easy to find here! The recipe looked easy enough and after checking my pantry for semolina flour, I mixed up a batch of the dough. This recipe instructs you to also make the tomato sauce but I suspect that you could use just about any sauce, homemade or purchased. Caciocavallo, which translates as cheese on horseback in English, is similar to Provolone in flavor and is made from either sheep or cow’s milk and as much as I would like to try it, I didn’t go out in search of it and just substituted some grated Asiago. First, the dough is rolled out into a large rectangle. The result is a very thin sheet which gets topped with sauce and cheese before being folded up. Then more sauce and cheese, more folding and finally, a log of layered dough, sauce and cheese is folded in half and placed into a pan lined with parchment paper. The loaf is not given a rising period but I did let mine sit for at least 30 minutes while the oven preheated. Looking at the loaf, I was worried. Knowing that only 1/4 teaspoon of yeast was used to leaven the dough was obvious; it did not appear to rise much, if at all. After baking the loaf for nearly and hour, I was surprised to see that it did rise a small amount. The aroma that filled the kitchen was undeniably that of lasagna or of a similar baked tomato sauce and pasta dish. Having waited for about 20 minutes, I carefully sliced into loaf and revealed the layers of spongy dough, tomato sauce and cheese. Not only did it smell like lasagna, it tasted like it too, both in flavor as well as the texture of the interior. The verdict, this is a recipe that I will turn to when I want something besides the usual layers of pasta, sauce and cheese, especially for a pot luck or picnic-it travels well and can left to cool, sliced an hour or two later without being reheated. This recipe has a lot of potential for variations. The sauce could be varied; pesto, alfredo, butternut squash and mushrooms all come to mind. Even the cheese could be swapped but, I look forward to finding a chunk of Caciocavallo so that I can taste it. If you can find a copy of issue 182, open it to page 70 and get to work, take note that a detailed set of instructions with illustrations on the folding methods is also included on page 74. For those of you that would rather just see the recipe, rejoice! Saveur magazine has the recipe posted on their website and it is available for free, find the recipe here, and the folding instructions here. It has been quite a while since I have participated in the Tuesdays with Dorie baking. What can I say, life gets in the way? Partly, the other angle; having a pile of sweets in the house for just two of us means we eat way more than we should! When I saw the choices included a bread recipe this month, I decided to get in gear and give it a go. Limpa is a type of black bread. The dough is made with rye flour and is a bit on the sweet side from the addition of molasses and brown sugar but what gives it the most flavor are the aromatic seeds in the dough. Anise, caraway and fennel seeds are crushed and added to the mix and so is a bit of orange zest (which I skipped) and the result is a slightly sweet, bread that has a touch of licorice flavor and a nice compact crumb. The recipe suggests using it for sandwiches, much like they do in Sweden, layering it with smoked meats and cheeses. We preferred to slice it and enjoy it toasted with butter. Rather than bake it in the round 9 inch pans the recipe calls for, I used 6 inch square pans. They made the most perfect cube shaped loaves and the slices were just large enough that two thin slices of toast were more than filling. My rye flour was stone ground and it added a nice texture to the crumb. Little flecks of rye and seeds, this one is a keeper. Since the recipe made two loaves, I froze one for later. On my last birthday, my husband gave me a copy of the Tartine Bread book. We were out on a rainy Saturday, wandering through the shops in Merchant Square and I had a chance to look through a copy of the book. The cover shot, the dark loaf with the blistered crust…Yes, it was bread lust at first glance. However, I suspect my husband was also lusting over that loaf of bread and now that I have made the Country Bread, I am sure of it! 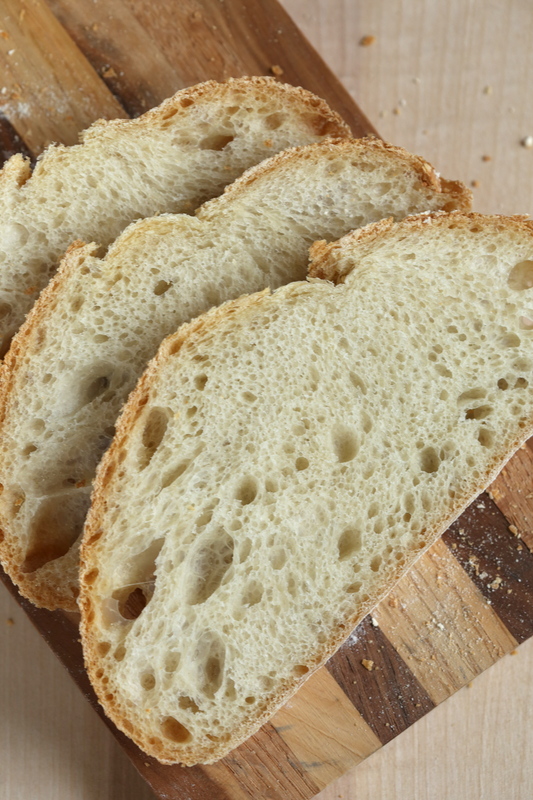 Like so many of the popular books on bread available, this one relies strictly on techniques created by the author and many aspects of the methods used seem at odds with traditional bread making. Most notably, the lack of extensive kneading to build structure and instead, the use of an autolyse so the flour can expand and absorb the water and a longer bulk rising to allow the gluten to develop slowly. Now, to be perfectly honest, the first section of the book consists of only one actual bread recipe with sub-recipes that rely on the basic recipe with various additions, but to really understand the technique, you must master the Country Bread. The entire collection of bread recipes in the book rely on the methods outlined in that very first recipe! 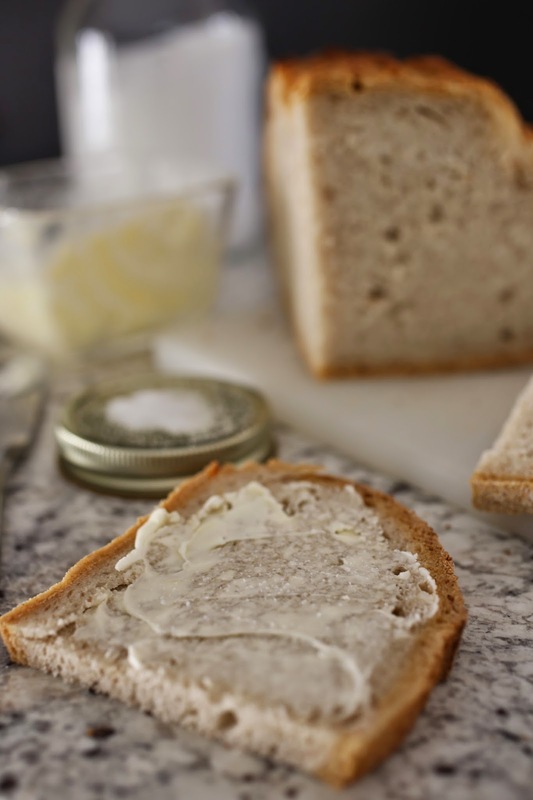 What I love most about the Country Bread recipe, simplicity. Especially the equipment list. First of all, you must have a scale that measures in grams. The rest of the list includes a thermometer, bowl, plastic bowl scraper, a bench knife and an oven proof dutch oven or covered casserole dish. The recipe is worked in percentages, called baker’s percentages and the weights are all in grams. The good news is that weighing it all out in grams guarantees consistency. The only step I did not follow was creating a starter to leaven the bread because I have a starter that I grew from grapes that were growing in the Demonstration Garden that I worked in when I lived in Tennessee. The starter has been in use since 2009 and when we moved in 2014, it was one of the things I was most worried about losing! We had a 12 hour drive, stopped multiple times for the dog and for the night in the middle of that drive, the entire time the starter was tucked in a cooler with some ice. It made the trip like a champ and nearly 2 years later, I am still using it. The starter is fed and allowed to develop overnight. If you read the recipe, you will be given many bits of information to help you along and I find that very helpful when using a new recipe. The instructions tell you to measure out the warm water, add the starter to it, and if it floats, it is fully developed and ready to go. As you can see in the photo above, my starter is floating in the water. 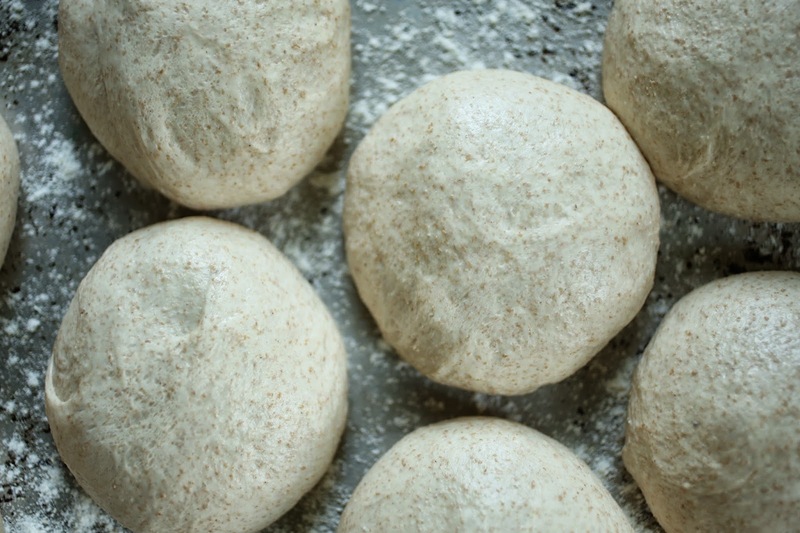 There are two schools of thought on adding salt to flour dough. One says add it to the dough as you add the flour, one calls for holding it back and adding it later because it can affect the structure of the dough. At Tartine, they hold the salt and a small amount of water back and add them after the initial mixing and resting period. The salt is sprinkled over the dough, water is poured on and using your hand, you squeeze and squish and work the dough onto itself to mix it all in. 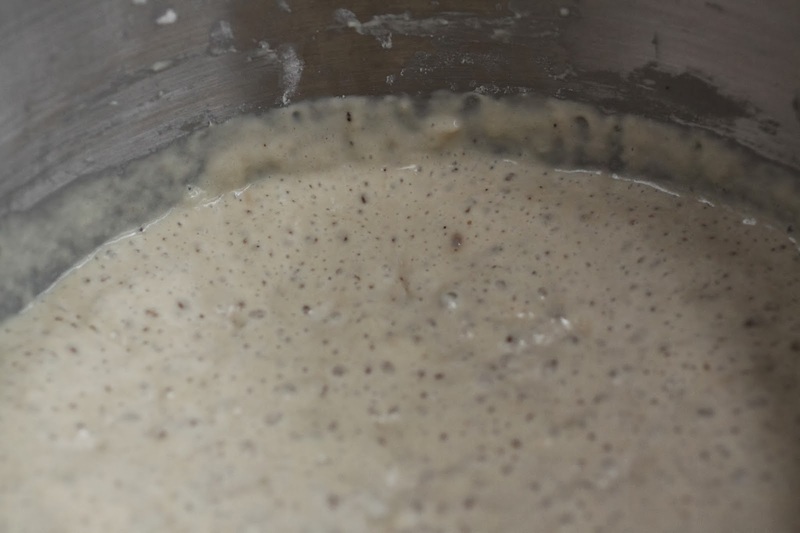 As the dough develops during the bulk fermentation, bubbles form around the sides of the bowl. Rather than dumping it onto a table and forcibly kneading it, the dough is “turned” in the bowl every thirty minutes for three hours. Using a wet hand, the dough is pulled up from the bottom of the bowl and stretched across itself, turning it. This is done 2-3 times each half hour, each time is called a “turn” and it is all the kneading the dough will get. 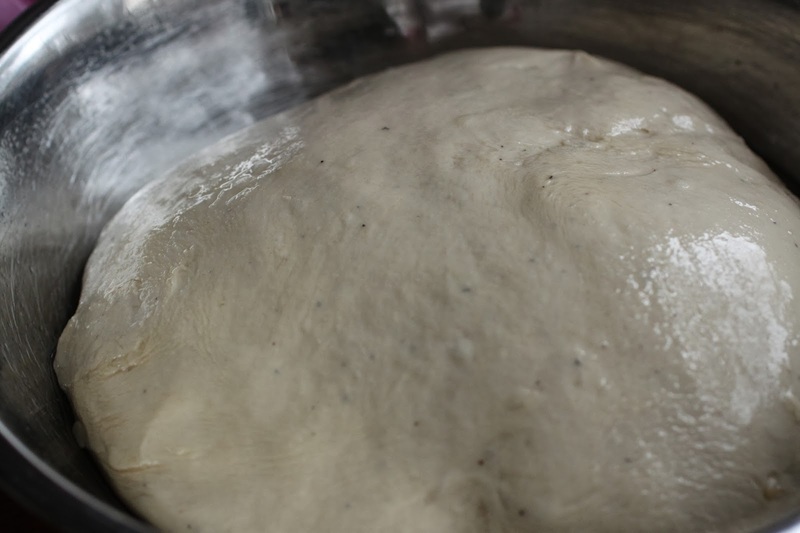 As the dough develops and rises, it gets softer and lighter and you need to take care not to press the air out in the process of turning the dough. When it is ready, dumped onto a table and cut in half. A minimal amount of flour is used to help with shaping. The folding and shaping is probably the most complicated step and it is completed with one hand and a bench knife. Lifting and stretching the dough across it’s center, it is carefully shaped so that it is not deflated. After shaping, it is allowed to rise in a cloth lined bowl which has been floured. The loaves rise for about 3 hours and because most of us do not have two dutch ovens or even the ability to bake with two of them simultaneously, you will want to hold one back by placing it in the fridge for a while. Once the oven and the dutch oven are heated properly, flour the surface of the dough (do not forget this step-it will not come out of the pan if you do!) and turn it into the hot pan. Using a lame or a very sharp blade, score the dough, cover it and place it in the oven. Twenty minutes covered, twenty minutes uncovered and it will be ready to take from the oven. Beautifully colored, perfectly blistered. Let it cool completely before cutting into the loaf. To see the recipe, please consider purchasing a copy of the book Tartine or at the very least, borrowing it from a library. There are many great videos of the author as well as other bakers making bread using the technique described in the book and they are worth watching so consider looking them up. The Country Bread recipe is available, reprinted with permission on the New York Times website. This is the Tuesdays with Dorie/Baking with Julia tale of two breads; the train wreck version and the fingers crossed I hope it works version. Bread baking has always been one aspect of my career that I completely lack confidence in. 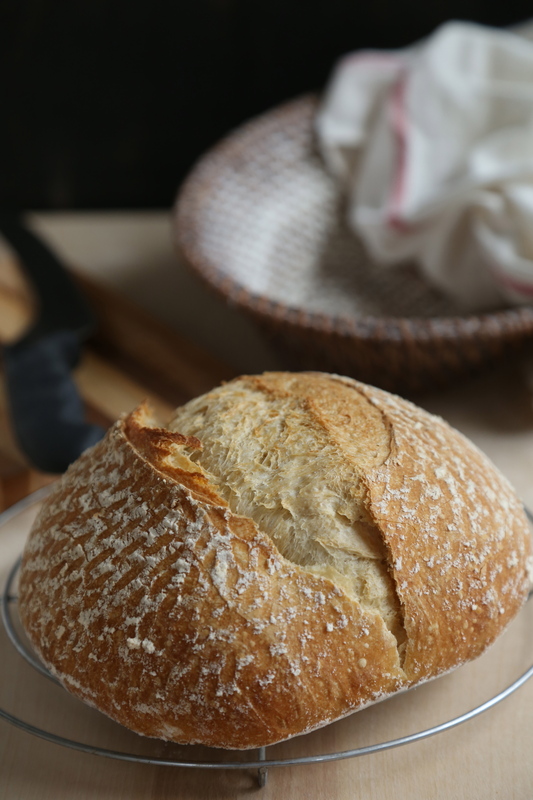 There are so many variables and so many ways for it to go wrong and yes, baking in general is often a disaster waiting to happen, but bread is where I have had so many more failures. As you know, baking is science oriented and when you add a living creature, yeast specifically, there are just so many more rules that must be followed. In my world, a baguette has always fallen into the buy it not bake it category because I have never achieved good results when baking one at home. First mistake; no bread dough to make the starter with. Not a problem, I subbed a small amount (1/4 cup) of my homemade starter. While this sounds good in theory, it made the starter very wet and it set the stage for more problems as I followed the recipe. In the final rise stage, my dough was simply too soft and probably could have used another half cup of flour to make up for the added moisture in the starter I used. However, the mistakes are not all mine. Did anyone else notice the rather large discrepancy between the photo tutorial on page 116 and the directions in the recipe on page 117? Give me a moment to vent and then I shall stumble down off my soapbox. First let me state that I admire Dorie greatly. She has helped put women bakers up in front of the crowd and to show the world that yes, women can be pastry chefs too. She has in a lot of ways done for baking what women like Alice Waters and Julia Child did for cooking as far as convincing the world that women can do this and do it just as well if not better than men. But editing is editing and as a published cookbook author, I can say that if the words under the photo do not match the words in the recipe, we’ve got a problem. While this may have been fixed in later editions, my $3 flea market find is actually a first edition and I had a major mishap as a result. 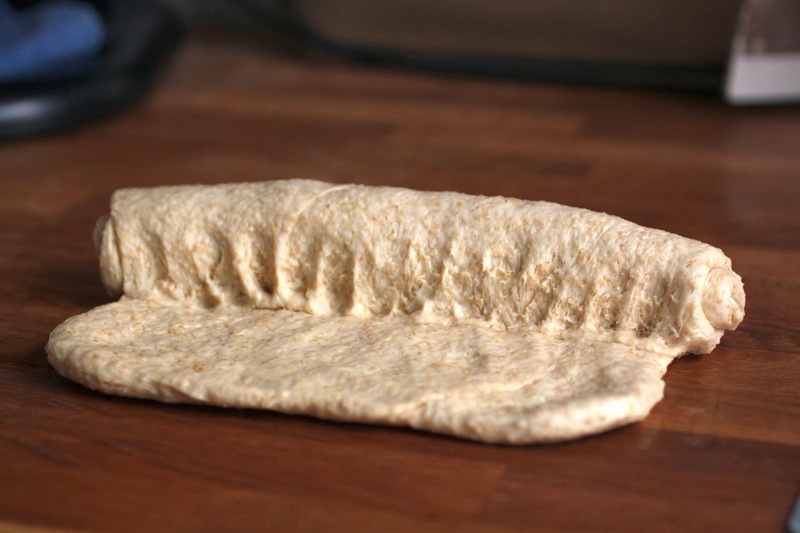 My complaint is simple, step 3 of the photo tutorial instructs you to fold the dough down again (the folding process starts in step 2) and to seal the seam…it then goes on to tell you to repeat this process once or twice to form a short log shape with a tight skin. That right there is it, one of the largest factors that my bread dough simply spread out rather than rise up and why it was not possible to get it off the floured towel without deflating it. If you read the recipe, it only tells you to complete the folding and rolling once. The tight skin is crucial not only to the success of a crispy, flaky skin but to the shape and the height of the loaf as well. After having nurtured this dough along for 2 days, arranging our day around the baking schedule and then having such a flop that I had to go out and buy bread for dinner, I was truly annoyed with myself for not succeeding. As I dumped half of the batch in the trash, I made the decision to save a piece of the dough and start again. Then, while standing there in my kitchen peeling the rest of the dough off of a floured towel, I could not bring myself to tossing it in the trash. Stubborn determination had me grabbing my basket and shaping the remaining dough. The dough was soft and a little sticky at first but as I worked at shaping it into a smooth ball, I saw a change in the texture, it was no longer soft and shapeless and it was now tight and structured. It rose beautifully in the basket and when it had doubled, I dumped it out on to the baking peel, slashed the top, slid it onto the heated stone in the oven and poured the water into the pan in the bottom of the oven. Voila! Picture perfect bread, and a lesson learned! 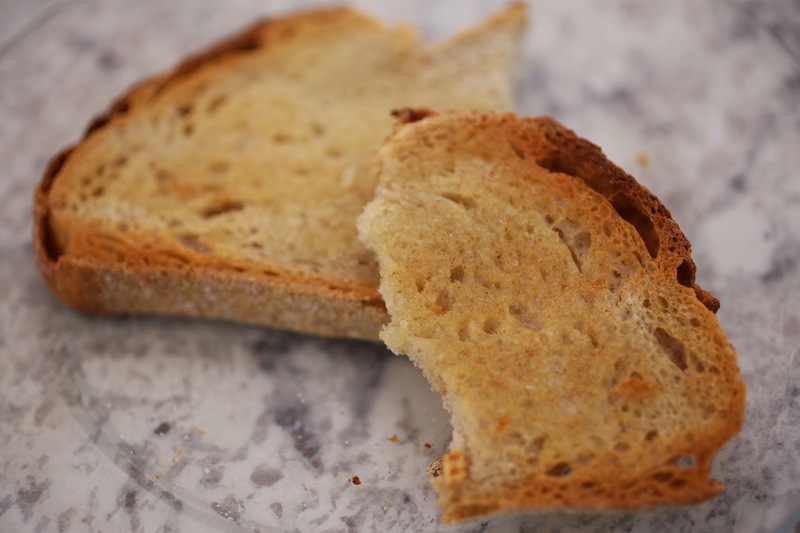 The crust was thin and crispy, just like a good baguette and despite the many missteps and the extra rise time, it has absolutely no sour taste. Just look at the interior of the loaf, all of the open bubbles you would expect after reading the recipe, but not the photo tutorial as it does not advise you to retain the open structure and air bubbles by handling it gently and not to deflate or mash it. In the end, I am better prepared to make a baguette and my second batch is nearing the final rise. Stay tuned fellow bakers, I will post additional photos when I get a decent loaf! To see what the other Tuesdays with Dorie bakers came up with, visit the website. When I actually began my sourdough starter is a little sketchy. My best guestimations are late summer in 2009 with grapes grown in the demonstration garden I worked in. As we packed up the house in Nashville in preparation for our move to Virginia, I knew the starter was coming with me; a souvenir of time spent in the garden with friends. Now that things have settled here, it was time to test it and see if it still could produce a loaf of bread. To make some starter, follow this recipe on food.com from Nancy Silverton, it is the one I used to get my starter going. If you are successful, you can use it in any recipe that calls for a starter. 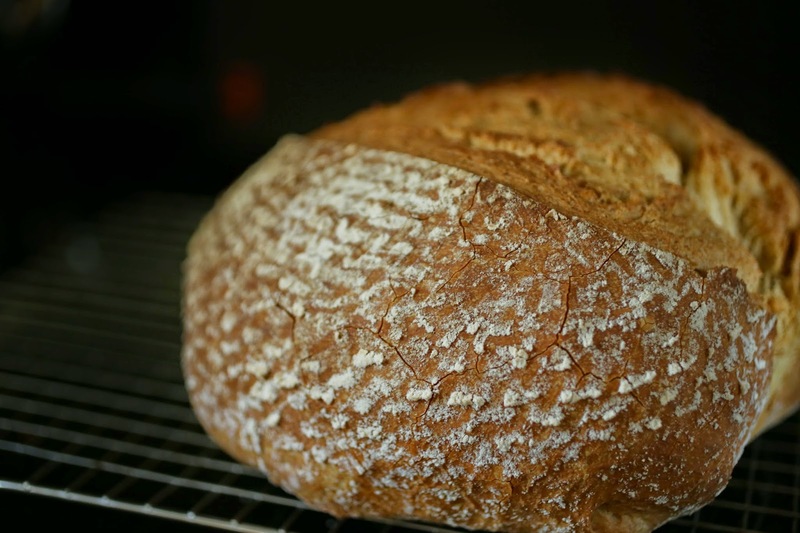 My favorite sourdough bread recipe is from Nick Malgieri’s wonderful book, How to Bake. The easy to use recipe also tells you how to make and maintain a starter but I just substitute my own starter and proceed with the recipe. 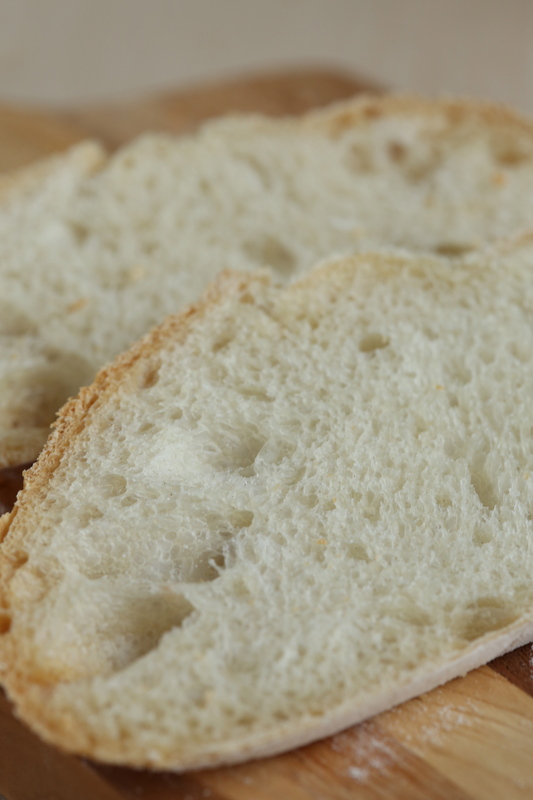 This is a true sourdough bread which means that it can take several days to make not counting the time needed to make a starter from scratch, so be sure to plan ahead. If your starter has been dormant, take the time to refresh and feed it and give it a couple days to become active. Once you are sure that it is ready to go, mix up the sponge and allow it to sit for about 24 hours to develop the best flavor. To make the sponge, whisk the starter and water together in a large bowl. Stir in the flour and cover the bowl tightly. Allow it to sit at room temperature for at least 8 hours, and up to 24. To make the dough, stir the sponge to deflate it, stir in 1 1/2 cups of the flour and the salt. You can knead by hand or machine to form a smooth, elastic and slightly sticky dough for about 5 minutes. Add additional flour as needed to make the dough manageable. Coat the dough in oil and rise it in a large bowl, covered with plastic, until doubled. This can take an hour or more-the temperature of your kitchen will control this. Most often, I let my dough rise in a cold oven(one that has not been heated) with the light on-you would be amazed at how much heat an oven light can produce! When the dough is ready, first set the oven up, then shape the dough. Place a rack in the center of the oven with your baking stone on it. Set a rack below the stone and place a heavy pan on it-this will be for adding steam to the oven so be sure it is a heavy gauge metal pan that can handle a sudden addition of water. Set a cup of water nearby. 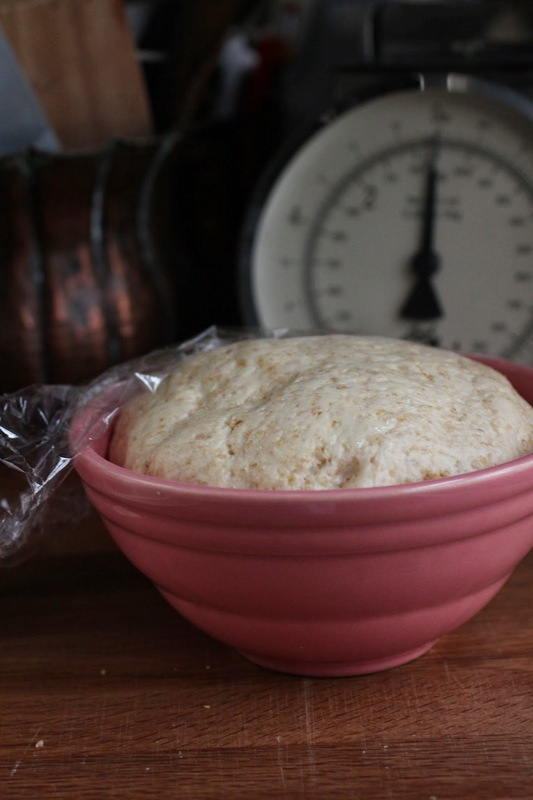 To shape the dough, scrape it out of the bowl and deflate it. Form it into and even round ball and be sure to seal the bottom seam well. Place it seam side up in a well floured bread basket or a bowl lined with a towel and is heavily floured. Cover the basket with plastic and allow the dough to rise until doubled, at least 1 hour. Thirty minutes before baking, turn the oven on to 500 degrees to heat the stone properly. Invert the loaf onto a baking peel that has a generous sprinkle of cornmeal, slash the top and slide the loaf onto the stone. Quickly pour the water into the tray and close the oven. After 20 minutes, reduce the oven temperature to 350 and continue to bake. After about 20 minutes, check the internal temperature of the bread with a thermometer-it will be 210F when finished. Bake the loaf at 350 for however long it takes to reach that temperature, it could be as long as 40 minutes total. Remove the bread from the stone and cool it completely on a rack before slicing. The bread will last a couple days at room temp but is best the day it is baked. To refresh it, wrap it in foil and bake it at 350 for 15 minutes but keep in mind, it will be pretty crispy when it cools-use the leftovers for bread crumbs, croutons or stuffing. Remember those buns from my last post? 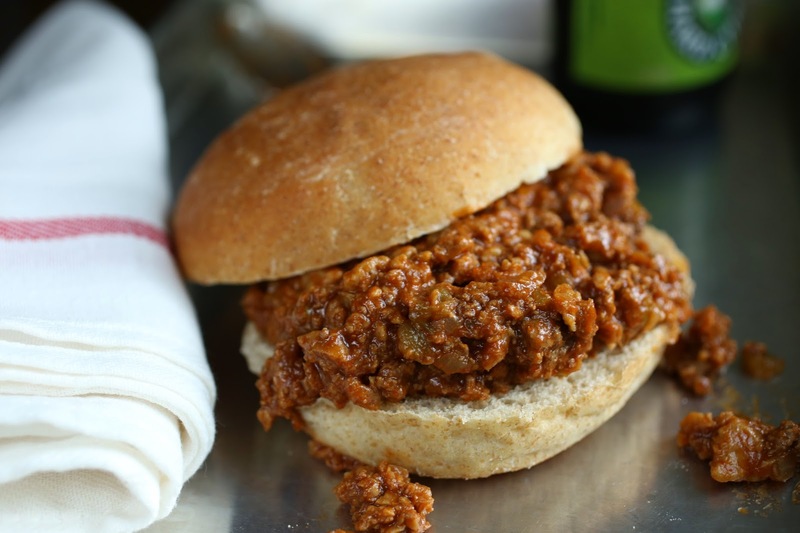 This is probably my favorite way to serve them-split open and overflowing with tangy sloppy joe filling! The buns can be frozen and so can the filling so make a full batch of both and split it-serve half and freeze half for a quick meal when you are short of time. Over medium heat, cook the beef or turkey until no longer pink. Add the onion and celery and saute until soft. Add the garlic and continue cooking for another minute. Place the contents of the pan into a mesh strainer and drain off the excess fat. Return the meat to the pan, add the remaining ingredients and simmer the mixture for 30-40 minutes. 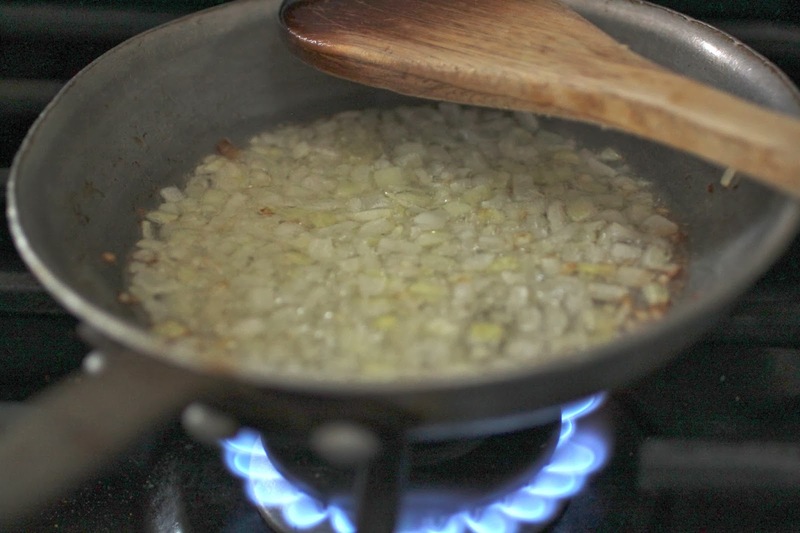 The mixture will thicken, if it becomes dry, you can add small amounts of broth or water, but be sure to simmer it long enough to allow the flavor to develop. 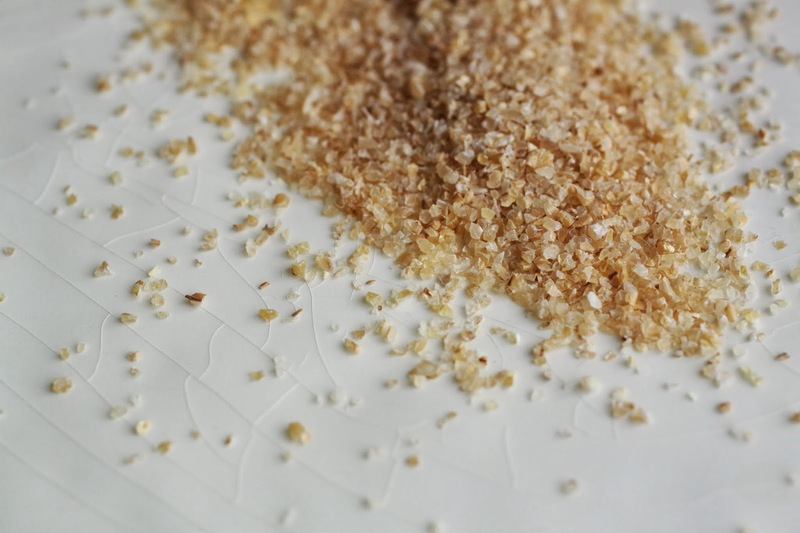 For those of you using soy crumbles instead of meat, you will need enough to replace two pounds of meat. Saute the onions and celery in olive oil until translucent. Add the garlic and saute for another minute. Add the crumbles and the remaining ingredients and follow the directions as written for the meat version. This recipe is a favorite of mine and I pull it out whenever I need fluffy buns that will stand up to the test. What could that test possibly be? Hamburgers, for one. 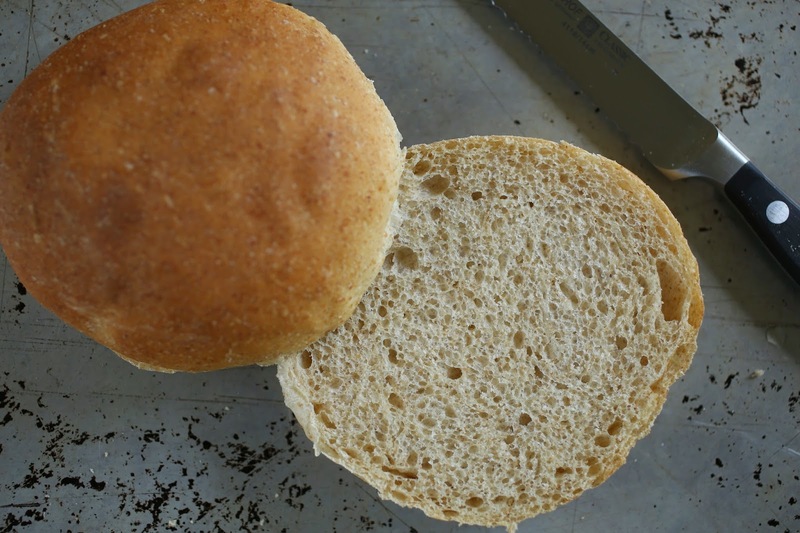 There is nothing worse than having a hamburger bun fall apart, disintegrate into pieces as you eat it; condiments and components falling onto the plate…Fear not, these buns will hold their own and remain intact until the last bite. Mixing the dough is a quick process, and can be done by machine or hand-you choose. You can make them with just plain flour or add some whole wheat as I have in this batch. To shape them, it is best if they are all about the size of a lemon, roughly 3-4 ounces each. Gently place your open palm on top and close your fingers around them so that your fingertips rest on the work surface. 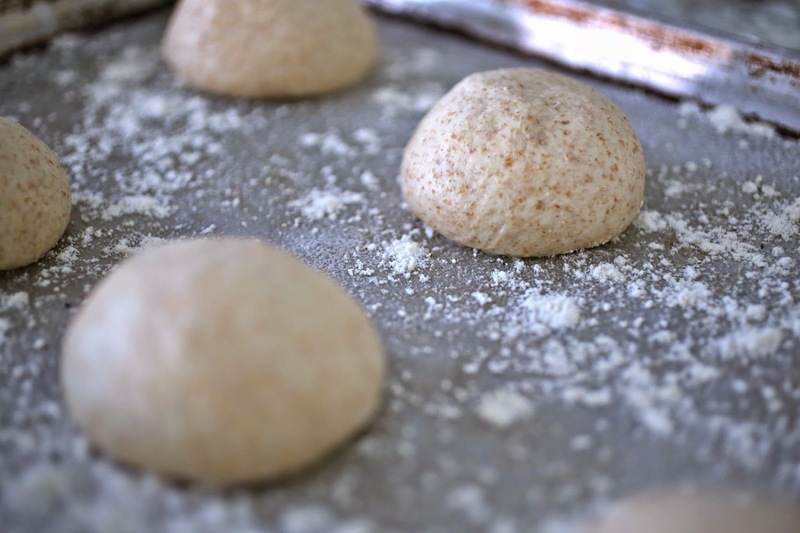 Slowly roll the dough in a circular motion until the ball of dough tightens and forms an evenly round ball. Place the prepared buns onto a baking tray that is liberally sprinkled with cornmeal. Allow them to rise until doubled in size. Doubled in size and ready to bake. 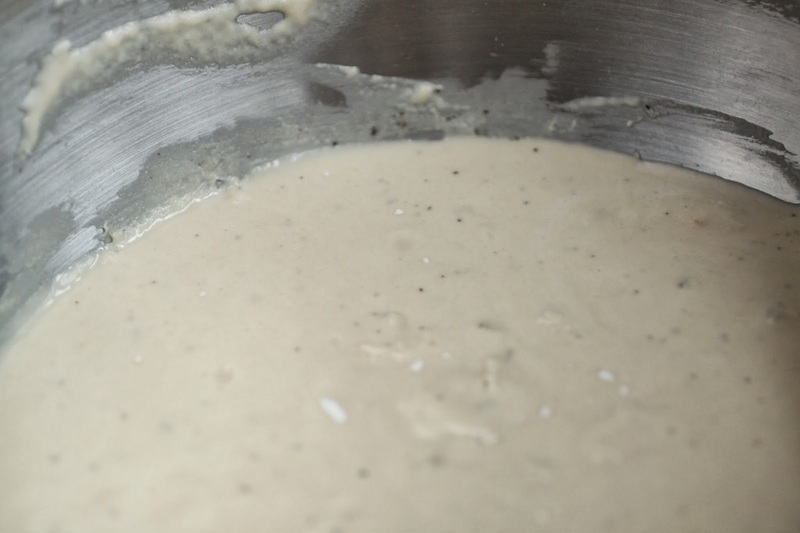 In a mixing bowl, mix the buttermilk, water, butter, sugar, salt and yeast. Allow it to stand until foamy, about 5 minutes. Stir in the whole wheat flour and 2 cups of the all purpose flour and mix to form a somewhat sticky dough. You can turn the dough out onto a floured surface and knead this by hand or use a stand mixer, either way, continue to add flour as needed to form a soft dough. Continue mixing until smooth and elastic, about 5 minutes. 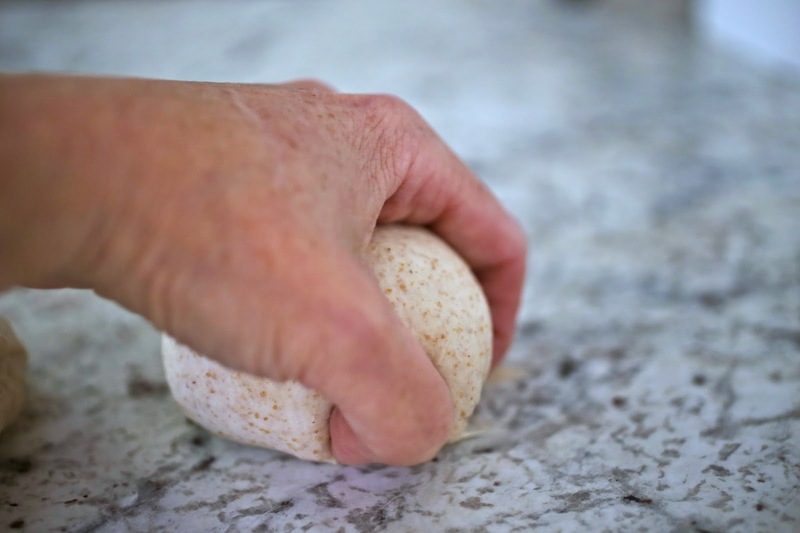 Shape the dough into a ball and place it in an oiled bowl, coating it completely with oil, cover it and allow it to rise until double, about 1 1/2 hours. To make buns, divide the dough into 3-4 ounce pieces or for those without scales, cut it in half, then in half again and continue this until you have about 14 even pieces. 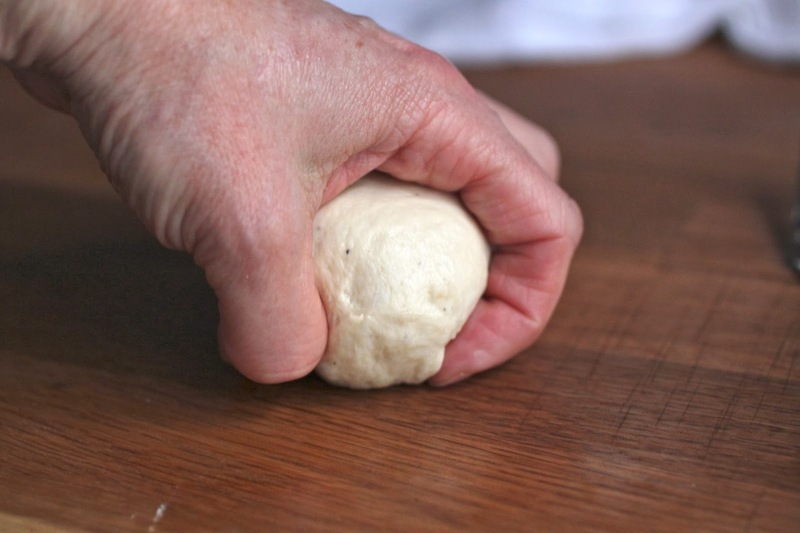 Shape them by rolling into tight buns by placing the dough in your hands and moving in a circular motion on the table/counter top until the bun is smooth and no visible seams show. Place the buns on pans that have been generously sprinkled with cornmeal. Allow to rise until double and bake in a 400 degree preheated oven until golden all over. let me start out by saying that bulgur is not cracked wheat. same grain but two completely different products. bulgur is a partially cooked whole grain wheat that is cut to various sizes while cracked wheat is simply that, uncooked, whole wheat grains that are cracked into pieces. they are also not necessarily interchangeable in recipes. something i learned the hard way recently! every now and then, i get a wild hair and try to make something with a recipe i found on pinterest. yes, a crap shoot has better odds but sometimes, you just gotta live life on the edge and this is about as risky as i like it. 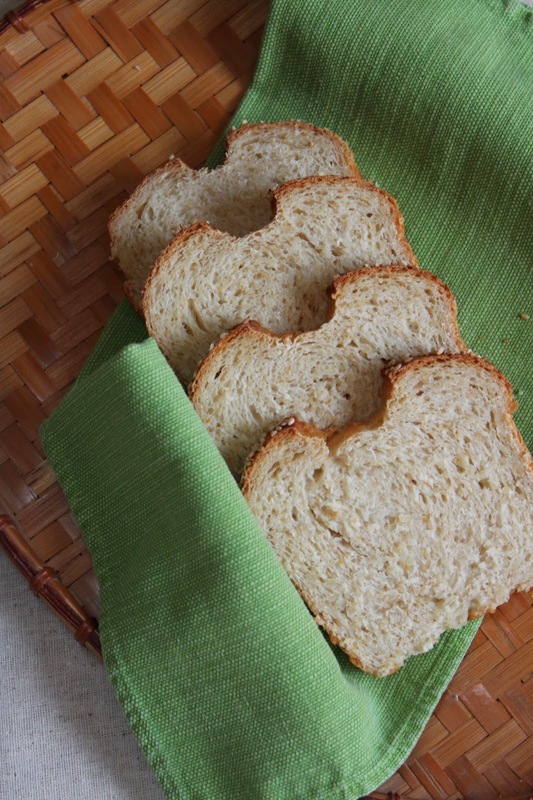 a recipe for cracked wheat bread popped up in my feed and i thought, well why not try it out? no cracked wheat in the pantry but there is plenty of bulgur, what is the worst thing that could happen??? for starters, the bulgur soaked up the water like a sponge! if i were to ever make this again, i would definitely add at least an extra half cup of water to the dough along with the cooked bulgur. because i did not do that, i used only half of the flour that the recipe called for and the resulting loaf was a little smaller and a little denser than it should have been. it was easy to work with-it shaped nicely. ready to rise. 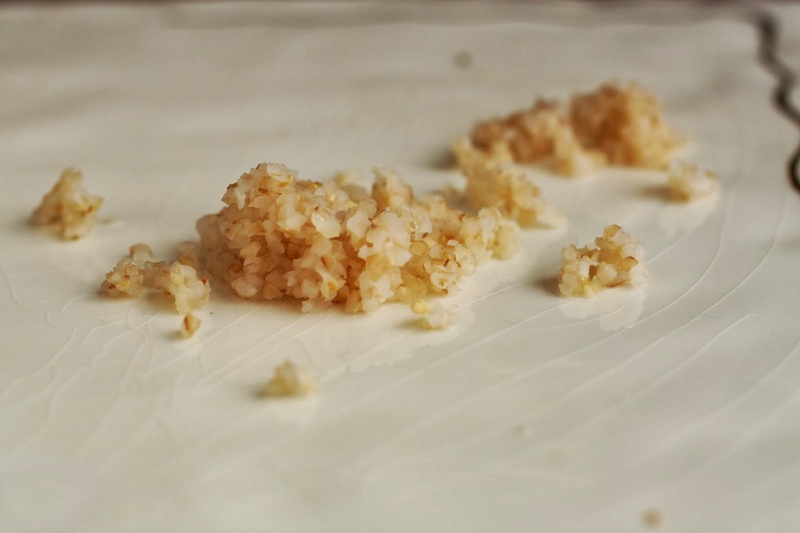 before baking, i gave it a coat of egg white wash and a generous sprinkle of sesame seeds. a nice deep slash to the center was the final touch before baking. the bread was a little denser due to the reduced amount of moisture but that did not matter much. it made lovely toast and really tasty grilled cheese sandwiches! 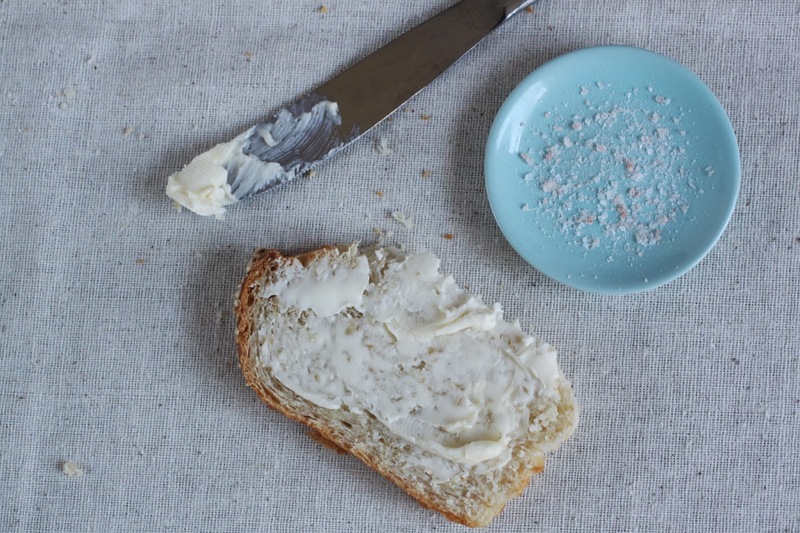 nothing quite like a slice of fresh baked bread with a slathering of butter and a sprinkle of salt. 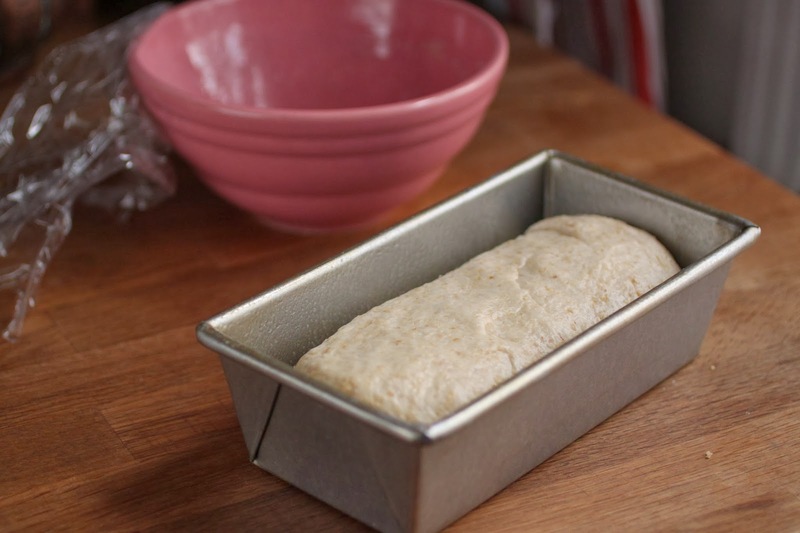 to see the recipe, head over to the blog, girl versus dough and bake up a loaf. 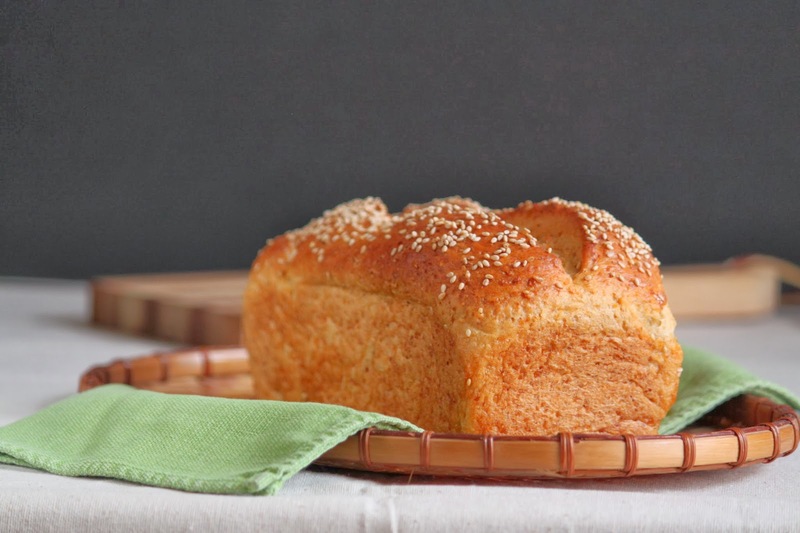 remember, if you do not have cracked wheat, you can use bulgur but you will need only half of the flour called for in the recipe or you can add additional water, about 1/2 a cup to the dough and add flour as needed. 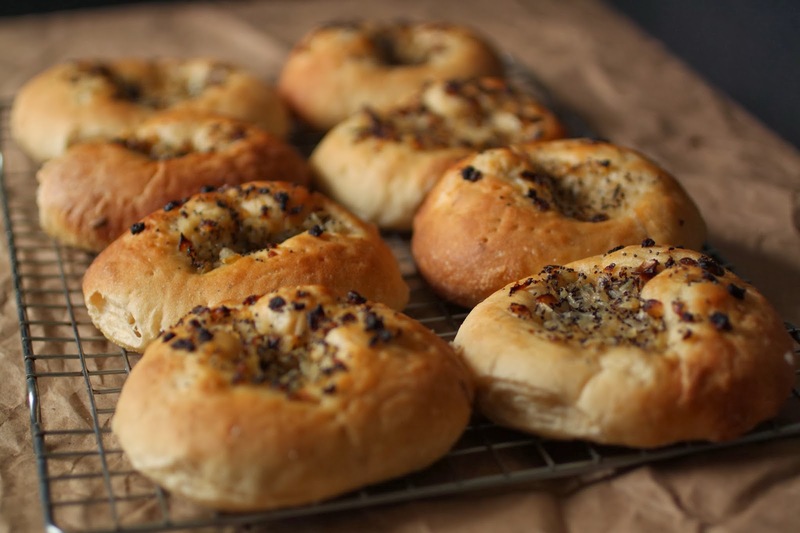 bialys are one of those things that you either have fond memories of or you have never heard of them. they aren’t very common once you get out of the areas lacking large jewish communities. having grown up just outside of manhattan in northern new jersey, i knew what they were, i saw them in places that sold bagels but i never ate them. looking back, i cannot explain why i had never eaten one. perhaps it was that my mother never ate them or purchased them. still, that is a little strange since onion bagels and onion rolls made their way into our kitchen on occasion. it wasn’t until i met my husband that i became more familiar with them. 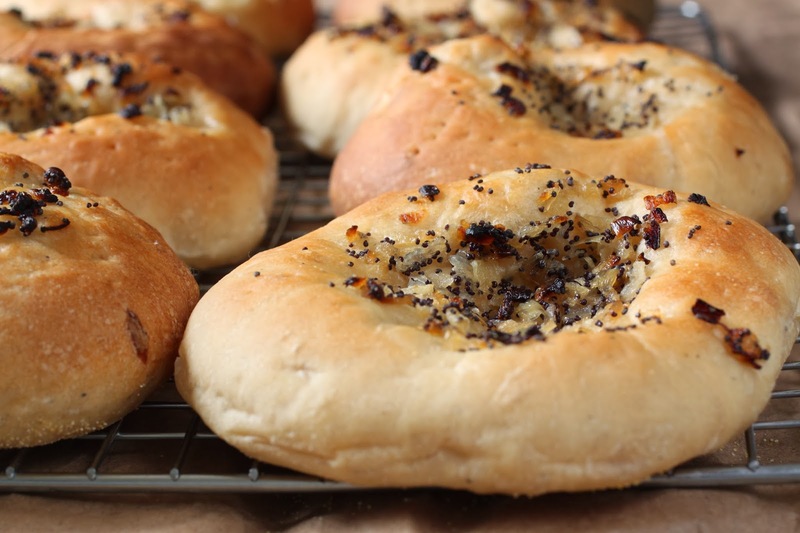 his fondness for a freshly baked onion bialy made an impression on me; not enough to make me a fellow devotee, but i would at least eat one on occasion. 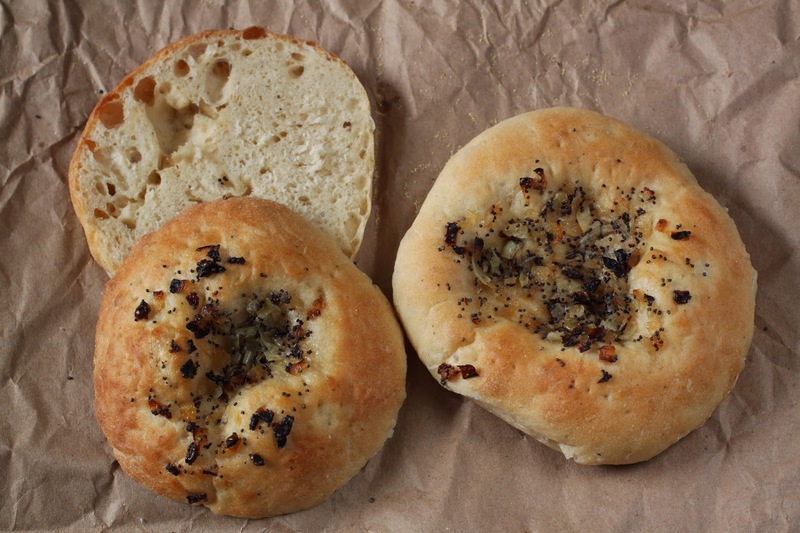 living in nashville, tennessee has made finding a proper, freshly baked bialy nearly impossible. on the rare occasion that he encounters one, he quickly proclaims it “okay, but not a real bialy” and knowing how picky he is, i generally avoid bringing them home. recently, he had to travel for work and was gone from home for 10 days. while he loves what he does, he did not particularly like being away for that long. no matter what hotel/motel you stay in, it just isn’t the same and he missed being home. 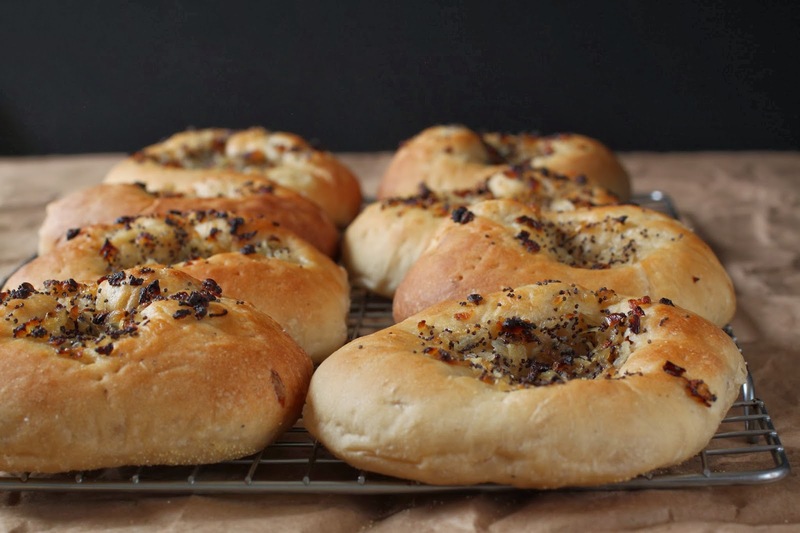 baking up a bunch of onion bialys for him seemed like it might make the perfect welcome home gift. it was also a great excuse to turn on the oven on yet another cold and dreary winter day. luckily for me, this recipe was the latest challenge chosen by my fellow tuesdays with dorie bakers as we work our way through the book, baking with julia. first step was to create a sponge. my husband likes to give me little gifts to use while baking. he gave me this jar of malt syrup and when i saw that the recipe called for malt syrup or sugar, i went with malt. 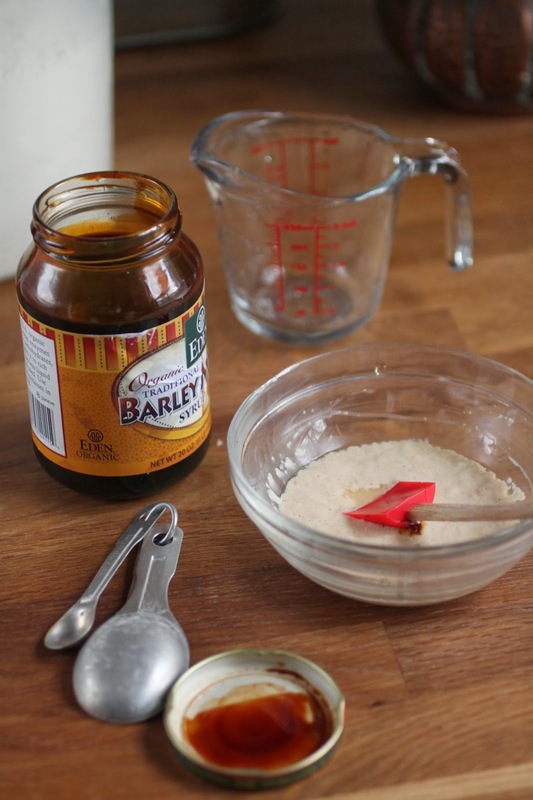 in commercial bakeries, malt syrup is used frequently since it offers flavor as well as the needed sugar to feed the yeast. they wouldn’t be onion bialys without freshly sauteed onions. now that we have a gas stove in our kitchen, i look for reasons to cook! the sponge is mixed up and allowed to sit for an hour. 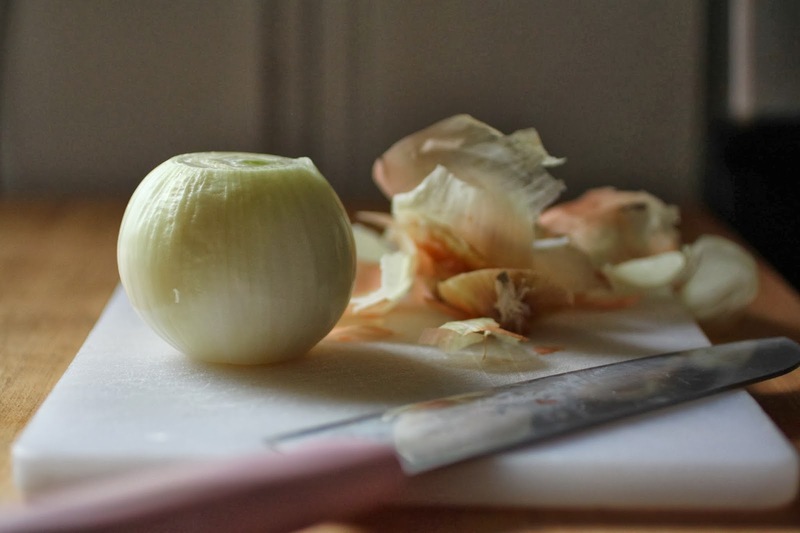 it isn’t a very long amount of time but it does contribute to the flavor of the finished product by allowing the onion flavor to steep into the dough. after an hour, it is very bubbly and ready to be added to the dough. the dough is mixed up and kneaded with the mixer-at least mine was. then it sits for a while as it is allowed to double in size. having made many dinner and sandwich rolls in my time, i could not shape the bialys without first giving them a little twist. after cutting up the dough, i placed a ball of dough in my hand and gently rotated it in a clockwise motion-you can see that my fingers are closed around the dough and touch the table. 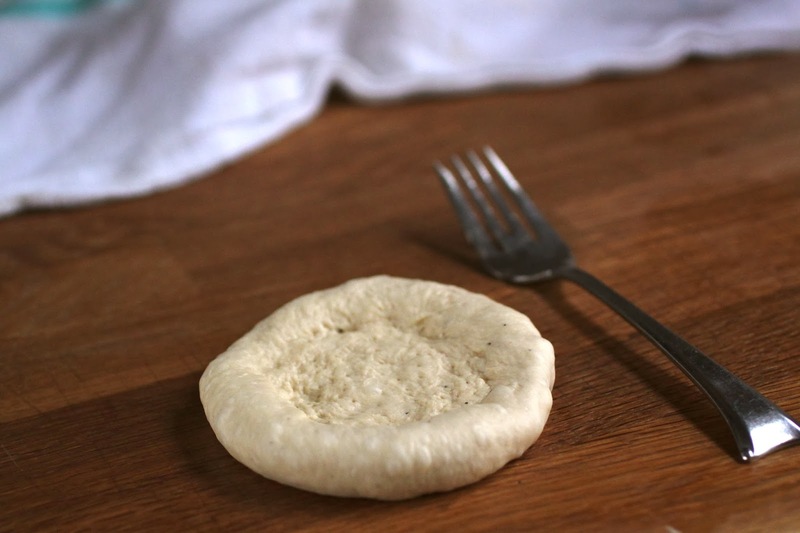 this gentle twist makes a perfect ball of dough that will give the final bialy a nicer, round shape. 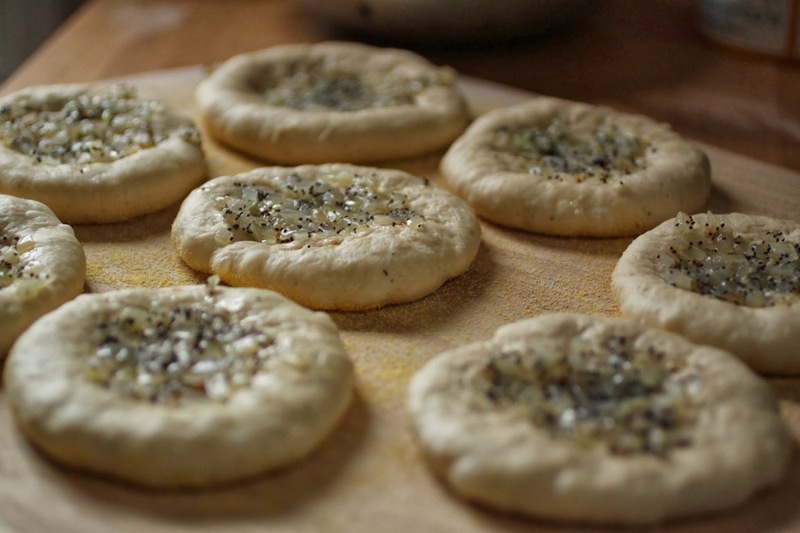 keep in mind that you do not need to go crazy, just a few quick swirls around the table; the longer you do it, the tighter the ball gets and the harder it is to make the final flattened round of dough needed for an authentically shaped bialy. placed on a cornmeal dusted peel and topped with onions and poppy seeds, these tasty treats are ready to hit the heated stone in the oven. as the afternoon wore on, the light shifted in the kitchen, these bialys would have to wait patiently for my husband to arrive. they look like funky bagels but honestly, they taste completely different. the recipe called for cutting the dough into 12 pieces, i went a little smaller and cut the dough into 16 pieces. the result was that i was able to share a few as well as eat a few without my husband missing out on any. to preserve them, i wrapped them individually in plastic wrap, bagged them up and froze them. he now has a snack when he wants one! true fans know that slitting and toasting them is optional and not necessarily correct. 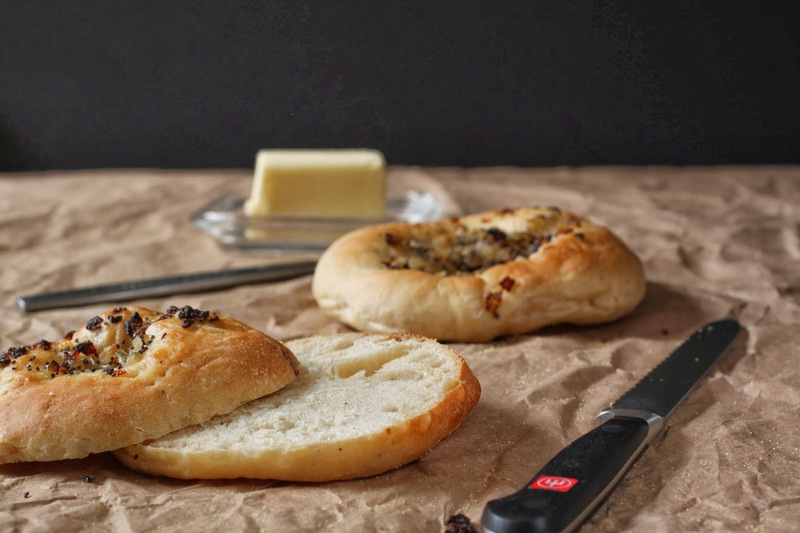 old time bialy eaters heat them whole and put a bit of butter in the center with the onions. however you like them, this recipe worked out well and my husband gave them a firm “pretty good, but…” and i will take that as a check in the success column. 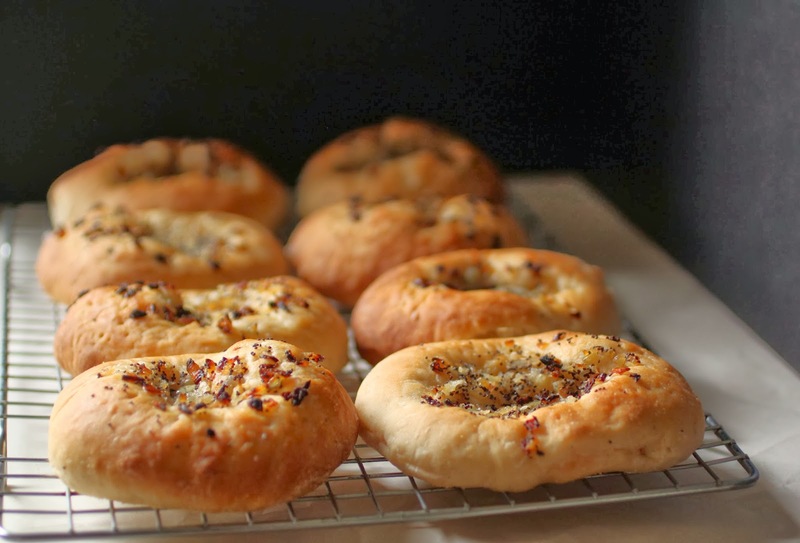 to learn more about bialys, look for a copy of the book, “the bialy eaters: the story of a bread and a lost world” by mimi sheraton and if you want to try a true bialy but do not want to make them, order some from kossar’s, they ship!